This structure provides a set of types that are commonly used during IR emission. It's initialized once in CodeGenModule's constructor and then copied around into new CodeGenFunctions. Definition at line 32 of file CodeGenTypeCache.h. Definition at line 115 of file CodeGenTypeCache.h. Referenced by clang::CodeGen::CodeGenFunction::CreateTempAlloca(), and clang::CodeGen::CodeGenFunction::EmitParmDecl(). Definition at line 78 of file CodeGenTypeCache.h. Referenced by clang::CodeGen::CodeGenFunction::EmitCall(), clang::CodeGen::CodeGenFunction::EmitCfiCheckFail(), FindIvarInterface(), getInitThreadEpochPtr(), and initializeForBlockHeader(). Definition at line 75 of file CodeGenTypeCache.h. Definition at line 108 of file CodeGenTypeCache.h. Referenced by buildBlockDescriptor(), buildGlobalBlock(), computeBlockInfo(), clang::CodeGen::createOffloadingBinaryDescriptorRegistration(), clang::CodeGen::CodeGenFunction::DecodeAddrUsedInPrologue(), clang::CodeGen::CodeGenFunction::EmitCall(), emitCopyprivateCopyFunction(), clang::CodeGen::emitDeclareTargetVarDefinition(), emitGlobalToListCopyFunction(), emitInterWarpCopyFunction(), emitListToGlobalCopyFunction(), emitOutlinedFunctionPrologue(), emitReductionCombiner(), emitReductionListCopy(), emitShuffleAndReduceFunction(), clang::CodeGen::emitTargetNumIterationsCall(), clang::CodeGen::CGOpenMPRuntimeNVPTX::emitTeamsOutlinedFunction(), clang::CodeGen::CodeGenFunction::EmitTypeCheck(), emitVoidPtrVAArg(), emitWritebackArg(), clang::CodeGen::CodeGenFunction::FinallyInfo::exit(), FindIvarInterface(), getBadTypeidFn(), getBlockLayoutInfoString(), clang::CodeGen::CodeGenFunction::getExceptionSlot(), clang::CodeGen::CodeGenModule::GetGlobalValue(), hasMRCWeakIvars(), InitCatchParam(), initializeForBlockHeader(), isTrivialFiller(), clang::CodeGen::markAsGlobalTarget(), performTypeAdjustment(), and clang::CodeGen::CodeGenFunction::StartFunction(). Definition at line 105 of file CodeGenTypeCache.h. Referenced by computeBlockInfo(), EmitNullBaseClassInitialization(), emitVoidPtrVAArg(), initializeForBlockHeader(), and clang::CodeGen::registerTargetGlobalVariable(). Definition at line 113 of file CodeGenTypeCache.h. Referenced by clang::CodeGen::CodeGenModule::CreateGlobalInitOrDestructFunction(), clang::CodeGen::CodeGenModule::CreateRuntimeFunction(), getClangCallTerminateFn(), and clang::CodeGen::CGOpenMPRuntime::getThreadID(). Definition at line 102 of file CodeGenTypeCache.h. Definition at line 99 of file CodeGenTypeCache.h. intptr_t, size_t, and ptrdiff_t, which we assume are the same size. The size and alignment of the builtin C type 'int'. This comes up enough in various ABI lowering tasks to be worth pre-computing. The size and alignment of a pointer into the generic address space. The size and alignment of size_t. Definition at line 66 of file CodeGenTypeCache.h. 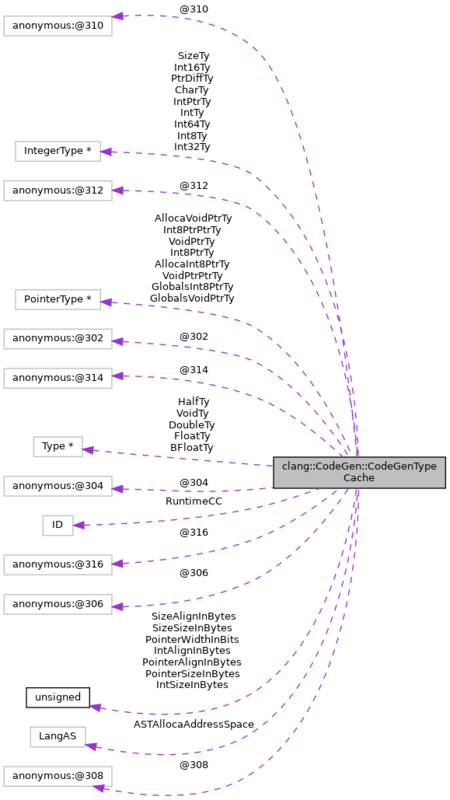 Referenced by clang::CodeGen::CodeGenFunction::EmitLifetimeEnd(), clang::CodeGen::CodeGenFunction::EmitLifetimeStart(), clang::CodeGen::CodeGenModule::getLLVMLifetimeEndFn(), and clang::CodeGen::CodeGenModule::getLLVMLifetimeStartFn(). Definition at line 65 of file CodeGenTypeCache.h. Definition at line 97 of file CodeGenTypeCache.h. Definition at line 39 of file CodeGenTypeCache.h. Referenced by EmitX86_64VAArgFromMemory(), GetFloatNeonType(), and GetNeonType(). Referenced by createBinOpInfoFromIncDec(), GetFloatNeonType(), and GetNeonType(). Referenced by GetFloatNeonType(), and GetNeonType(). Definition at line 37 of file CodeGenTypeCache.h. Referenced by clang::CodeGen::CGOpenMPRuntimeNVPTX::clear(), clang::CodeGen::CGOpenMPRuntimeNVPTX::createNVPTXRuntimeFunction(), createRuntimeShuffleFunction(), clang::CodeGen::CGOpenMPRuntimeNVPTX::emitTeamsOutlinedFunction(), GetNeonType(), and clang::CodeGen::CodeGenModule::lookupRepresentativeDecl(). Referenced by clang::CodeGen::CGOpenMPRuntime::CGOpenMPRuntime(), ConvertVec3AndVec4(), createConstantGlobalStructAndAddToParent(), clang::CodeGen::createDispatchFiniFunction(), clang::CodeGen::createDispatchInitFunction(), clang::CodeGen::createDispatchNextFunction(), clang::CodeGen::createForStaticInitFunction(), clang::CodeGen::CGOpenMPRuntimeNVPTX::createNVPTXRuntimeFunction(), clang::CodeGen::createOffloadEntriesAndInfoMetadata(), clang::CodeGen::CGOpenMPRuntime::createOffloadEntry(), clang::CodeGen::createRuntimeFunction(), clang::CodeGen::CodeGenModule::EmitAnnotationLineNo(), clang::CodeGen::CodeGenFunction::EmitBuiltinAvailable(), clang::CodeGen::CodeGenFunction::EmitCall(), clang::CodeGen::CodeGenFunction::EmitCfiCheckFail(), clang::CodeGen::CGOpenMPRuntimeNVPTX::emitCriticalRegion(), emitForStaticInitCall(), emitGlobalToListCopyFunction(), emitGlobalToListReduceFunction(), emitInterWarpCopyFunction(), emitListToGlobalCopyFunction(), emitListToGlobalReduceFunction(), EmitMSVCRTSetJmp(), emitNumTeamsForTargetDirective(), emitNumThreadsForTargetDirective(), clang::CodeGen::CGOpenMPRuntimeNVPTX::emitParallelCall(), emitReduceFiniFunction(), emitRTtypeidCall(), clang::CodeGen::CodeGenFunction::EmitStoreThroughExtVectorComponentLValue(), EmitX86_64VAArgFromMemory(), clang::CodeGen::CodeGenFunction::EncodeAddrForUseInPrologue(), clang::CodeGen::CodeGenModule::GetAddrOfConstantCFString(), getAsInt32(), getAsmSrcLocInfo(), GetConstantStringEntry(), clang::CodeGen::CodeGenFunction::getEHSelectorSlot(), clang::CodeGen::CodeGenModule::GetGlobalValue(), clang::CodeGen::getKmpc_MicroPointerTy(), GetNeonType(), getNumThreads(), getPersonalityFn(), clang::CodeGen::CodeGenModule::lookupRepresentativeDecl(), clang::CodeGen::markAsGlobalTarget(), clang::CodeGen::ConstantEmitter::registerCurrentAddrPrivate(), clang::CodeGen::CodeGenModule::Release(), rewriteInputConstraintReferences(), clang::CodeGen::CGOpenMPRuntime::setLocThreadIdInsertPt(), and clang::CodeGen::CodeGenFunction::StartFunction(). Referenced by createBinOpInfoFromIncDec(), clang::CodeGen::CodeGenModule::CreateCrossDsoCfiTypeId(), clang::CodeGen::createDispatchInitFunction(), clang::CodeGen::createDispatchNextFunction(), clang::CodeGen::createForStaticInitFunction(), clang::CodeGen::CGOpenMPRuntimeNVPTX::createNVPTXRuntimeFunction(), clang::CodeGen::createRuntimeFunction(), clang::CodeGen::CodeGenFunction::EmitCfiCheckStub(), clang::CodeGen::CodeGenFunction::EmitCfiSlowPathCheck(), emitCommonOMPTargetDirective(), clang::CodeGen::CodeGenFunction::EmitInvariantStart(), clang::CodeGen::CodeGenFunction::EmitLifetimeStart(), emitOffloadingArraysArgument(), clang::CodeGen::emitTaskInit(), clang::CodeGen::CodeGenFunction::EmitTypeCheck(), EmitX86Muldq(), GetNeonType(), getTypeInfoLinkage(), isCheapEnoughToEvaluateUnconditionally(), and rewriteInputConstraintReferences(). Definition at line 60 of file CodeGenTypeCache.h. Referenced by buildGlobalBlock(), callSpecialFunction(), clang::CodeGen::CGOpenMPRuntimeNVPTX::createNVPTXRuntimeFunction(), clang::CodeGen::CodeGenFunction::DecodeAddrUsedInPrologue(), emitARCCopyOperation(), clang::CodeGen::CodeGenFunction::EmitARCDestroyWeak(), emitARCLoadOperation(), emitARCStoreOperation(), clang::CodeGen::CodeGenFunction::EmitARCStoreStrongCall(), and clang::CodeGen::getOrCreateThreadPrivateCache(). Definition at line 54 of file CodeGenTypeCache.h. Referenced by clang::CodeGen::swiftcall::SwiftAggLowering::addTypedData(), ApplyNonVirtualAndVirtualOffset(), CanUseSingleInheritance(), createConstantGlobalStructAndAddToParent(), clang::CodeGen::CGOpenMPRuntimeNVPTX::createNVPTXRuntimeFunction(), clang::CodeGen::CGOpenMPRuntime::createOffloadEntry(), clang::CodeGen::CodeGenVTables::createVTableInitializer(), decomposeTypeForEH(), clang::CodeGen::CodeGenModule::EmitAnnotateAttr(), clang::CodeGen::CodeGenFunction::EmitAnnotationCall(), emitARCLoadOperation(), clang::CodeGen::CodeGenFunction::EmitARCRelease(), clang::CodeGen::CodeGenFunction::EmitARCRetainAutorelease(), emitARCStoreOperation(), clang::CodeGen::CodeGenFunction::EmitARCStoreStrongCall(), emitARCValueOperation(), EmitBitTestIntrinsic(), clang::CodeGen::CodeGenFunction::EmitCall(), clang::CodeGen::CodeGenFunction::EmitCastToVoidPtr(), emitCatchDispatchBlock(), clang::CodeGen::CodeGenFunction::EmitCfiCheckFail(), clang::CodeGen::CodeGenFunction::EmitCfiCheckStub(), clang::CodeGen::CodeGenFunction::EmitCfiSlowPathCheck(), clang::CodeGen::CodeGenFunction::EmitCheck(), clang::CodeGen::CodeGenFunction::EmitCheckSourceLocation(), emitCPPObjectAtomicGetterCall(), emitCPPObjectAtomicSetterCall(), clang::CodeGen::emitDeclareTargetVarDefinition(), EmitDeclDestroy(), clang::CodeGen::CodeGenFunction::EmitFieldAnnotations(), emitGlobalDtorWithCXAAtExit(), clang::CodeGen::CodeGenFunction::emitImplicitAssignmentOperatorBody(), clang::CodeGen::CodeGenFunction::EmitInvariantStart(), EmitMSVCRTSetJmp(), clang::CodeGen::CodeGenFunction::EmitObjCAutoreleasePoolPop(), clang::CodeGen::CodeGenFunction::EmitObjCRelease(), emitObjCValueOperation(), clang::CodeGen::CGOpenMPRuntimeNVPTX::emitParallelCall(), emitRTtypeidCall(), clang::CodeGen::CodeGenFunction::EmitSEHExceptionInfo(), emitStructSetterCall(), clang::CodeGen::CGOpenMPRuntime::emitTargetOutlinedFunctionHelper(), clang::CodeGen::CodeGenVTables::EmitThunks(), clang::CodeGen::CodeGenFunction::EmitTypeCheck(), clang::CodeGen::CGObjCRuntime::EmitValueForIvarAtOffset(), clang::CodeGen::CodeGenFunction::EmitVarAnnotations(), emitVoidPtrDirectVAArg(), clang::CodeGen::CodeGenFunction::FinallyInfo::enter(), clang::CodeGen::CodeGenModule::GetAddrOfRTTIDescriptor(), getAllocateExceptionFn(), getBeginCatchFn(), getBlockLayoutInfoString(), getBundlesForCoroEnd(), getCatchallRethrowFn(), getCatchAllValue(), getClangCallTerminateFn(), GetConstantStringEntry(), clang::CodeGen::CodeGenFunction::getExceptionSlot(), getFreeExceptionFn(), GetGCAttrTypeForType(), getGetExceptionPtrFn(), clang::CodeGen::CodeGenFunction::GetIndirectGotoBlock(), getItaniumDynamicCastFn(), getOpaquePersonalityFn(), clang::CodeGen::getOrCreateThreadPrivateCache(), getThrowFn(), getTypeInfoLinkage(), getTypeInfoVTable(), getUnexpectedFn(), clang::CodeGen::CodeGenVTables::getVTableType(), hasMRCWeakIvars(), isBlockVarRef(), isSimpleZero(), performTypeAdjustment(), pushTemporaryCleanup(), setPropertyExecutionMode(), and clang::CodeGen::CodeGenFunction::StartFunction(). Referenced by CheckAggExprForMemSetUse(), computeBlockInfo(), constStructWithPadding(), clang::CodeGen::CodeGenTypes::ConvertType(), createBinOpInfoFromIncDec(), CreateCoercedLoad(), CreateCoercedStore(), clang::CodeGen::CGBuilderTy::CreateConstByteGEP(), clang::CodeGen::CGBuilderTy::CreateConstInBoundsByteGEP(), clang::CodeGen::CGOpenMPRuntimeNVPTX::createNVPTXRuntimeFunction(), clang::CodeGen::createOffloadingBinaryDescriptorRegistration(), emitAddressAtOffset(), clang::CodeGen::CodeGenFunction::EmitArraySubscriptExpr(), clang::CodeGen::CodeGenFunction::EmitAutoVarInit(), EmitBitTestIntrinsic(), clang::CodeGen::CodeGenFunction::EmitCall(), clang::CodeGen::CodeGenFunction::EmitCfiCheckFail(), clang::CodeGen::emitDeclareTargetVarDefinition(), clang::CodeGen::ConstantEmitter::emitForMemory(), emitGlobalDtorWithCXAAtExit(), emitNonZeroVLAInit(), clang::CodeGen::CodeGenFunction::EmitNullabilityCheck(), EmitNullBaseClassInitialization(), clang::CodeGen::CodeGenFunction::EmitNullInitialization(), emitStoresForConstant(), clang::CodeGen::CGOpenMPRuntime::emitTargetOutlinedFunctionHelper(), clang::CodeGen::CGOpenMPRuntimeNVPTX::emitTeamsOutlinedFunction(), clang::CodeGen::CodeGenFunction::EmitTypeCheck(), EmitX86BitTestIntrinsic(), clang::CodeGen::ConstantEmitter::getCurrentAddrPrivate(), GetNeonType(), getThreadLocalWrapperLinkage(), hasDefaultCXXMethodCC(), isBlockVarRef(), isFullSizeType(), clang::CodeGen::ABIInfo::isHomogeneousAggregate(), isSimpleZero(), clang::CodeGen::CodeGenModule::lookupRepresentativeDecl(), performTypeAdjustment(), clang::CodeGen::CGCXXABI::ReadArrayCookie(), and setPropertyExecutionMode(). Definition at line 73 of file CodeGenTypeCache.h. Definition at line 46 of file CodeGenTypeCache.h. Referenced by CoerceIntOrPtrToIntOrPtr(), CreateCoercedLoad(), CreateCoercedStore(), clang::CodeGen::createRuntimeFunction(), clang::CodeGen::CodeGenFunction::DecodeAddrUsedInPrologue(), clang::CodeGen::CodeGenFunction::EmitAlignmentAssumption(), clang::CodeGen::CodeGenFunction::EmitArraySubscriptExpr(), clang::CodeGen::CodeGenFunction::EmitAsanPrologueOrEpilogue(), clang::CodeGen::CodeGenFunction::EmitAutoVarInit(), clang::CodeGen::CodeGenFunction::EmitCall(), clang::CodeGen::CodeGenFunction::EmitCfiCheckFail(), clang::CodeGen::CodeGenFunction::EmitCheck(), clang::CodeGen::CodeGenFunction::EmitCheckValue(), emitNonZeroVLAInit(), clang::CodeGen::CodeGenFunction::EmitOMPArraySectionExpr(), emitRoundPointerUpToAlignment(), emitStoresForConstant(), clang::CodeGen::CodeGenFunction::EmitStoreThroughLValue(), clang::CodeGen::emitTaskInit(), clang::CodeGen::CodeGenFunction::EmitTypeCheck(), clang::CodeGen::CodeGenFunction::EncodeAddrForUseInPrologue(), clang::CodeGen::CodeGenModule::GetAddrOfConstantCFString(), clang::CodeGen::CGOpenMPRuntime::getCriticalRegionLock(), GetGCAttrTypeForType(), and clang::CodeGen::ConstantEmitter::tryEmitPrivate(). Definition at line 72 of file CodeGenTypeCache.h. Definition at line 42 of file CodeGenTypeCache.h. Referenced by buildGlobalBlock(), clang::CodeGen::CGOpenMPRuntimeNVPTX::createNVPTXRuntimeFunction(), clang::CodeGen::createRuntimeFunction(), decomposeTypeForEH(), detectAmbiguousBases(), clang::CodeGen::CodeGenFunction::EmitAtomicLoad(), emitForStaticInitCall(), emitGlobalDtorWithCXAAtExit(), emitGlobalDtorWithTLRegDtor(), emitInterWarpCopyFunction(), EmitMSVCRTSetJmp(), clang::CodeGen::CodeGenFunction::EmitNVPTXDevicePrintfCallExpr(), emitReduceFiniFunction(), clang::CodeGen::CodeGenFunction::EmitSEHExceptionCodeSave(), clang::CodeGen::emitTaskInit(), clang::CodeGen::CodeGenModule::GetAddrOfConstantCFString(), GetConstantStringEntry(), clang::CodeGen::CGOpenMPRuntime::getCriticalRegionLock(), getInitThreadAbortFn(), getInitThreadEpochPtr(), getInitThreadFooterFn(), getInitThreadHeaderFn(), initializeForBlockHeader(), and clang::CodeGen::CodeGenFunction::registerGlobalDtorWithAtExit(). Definition at line 87 of file CodeGenTypeCache.h. Referenced by BuildAppleKextVirtualCall(), clang::CodeGen::CodeGenFunction::EmitARCStoreStrong(), and clang::CodeGen::CodeGenModule::GetAddrOfUuidDescriptor(). Definition at line 88 of file CodeGenTypeCache.h. The width of a pointer into the generic address space. Definition at line 83 of file CodeGenTypeCache.h. Referenced by clang::CodeGen::CodeGenFunction::emitImplicitAssignmentOperatorBody(), and clang::CodeGen::CodeGenFunction::EmitOMPArraySectionExpr(). Definition at line 48 of file CodeGenTypeCache.h. Referenced by ApplyNonVirtualAndVirtualOffset(), clang::CodeGen::CodeGenVTables::EmitThunks(), clang::CodeGen::CodeGenModule::GetNonVirtualBaseClassOffset(), and tryEmitFMulAdd(). Definition at line 112 of file CodeGenTypeCache.h. Definition at line 94 of file CodeGenTypeCache.h. Definition at line 93 of file CodeGenTypeCache.h. Definition at line 47 of file CodeGenTypeCache.h. Referenced by clang::CodeGen::CGOpenMPRuntimeNVPTX::clear(), createBinOpInfoFromIncDec(), clang::CodeGen::CGOpenMPRuntimeNVPTX::createNVPTXRuntimeFunction(), clang::CodeGen::CGOpenMPRuntime::createOffloadEntry(), clang::CodeGen::createRuntimeFunction(), clang::CodeGen::CodeGenFunction::emitArrayDestroy(), clang::CodeGen::CodeGenFunction::emitArrayLength(), EmitCommonNeonSISDBuiltinExpr(), EmitCXXNewAllocSize(), clang::CodeGen::emitDeclareTargetVarDefinition(), emitGlobalToListReduceFunction(), clang::CodeGen::CodeGenFunction::emitImplicitAssignmentOperatorBody(), emitListToGlobalReduceFunction(), clang::CodeGen::CodeGenFunction::EmitLoadOfExtVectorElementLValue(), emitOffloadingArrays(), emitOffloadingArraysArgument(), clang::CodeGen::CGOpenMPRuntimeNVPTX::emitOutlinedFunctionCall(), clang::CodeGen::CGOpenMPRuntimeNVPTX::emitParallelCall(), emitPartialArrayDestroy(), emitReduceFiniFunction(), emitReductionCombiner(), emitReductionListCopy(), clang::CodeGen::CodeGenFunction::EmitStoreThroughExtVectorComponentLValue(), clang::CodeGen::emitTaskInit(), clang::CodeGen::CGOpenMPRuntimeNVPTX::emitTeamsOutlinedFunction(), clang::CodeGen::CodeGenFunction::EmitVariablyModifiedType(), getAllocateExceptionFn(), clang::CodeGen::CGBuilderTy::getSize(), clang::CodeGen::CodeGenModule::getSize(), getUsualDeleteParams(), clang::CodeGen::CodeGenFunction::getVLAElements1D(), clang::CodeGen::CodeGenFunction::getVLASize(), isSimpleZero(), isTrivialFiller(), performTypeAdjustment(), and clang::CodeGen::CGCXXABI::readArrayCookieImpl(). Definition at line 59 of file CodeGenTypeCache.h. Referenced by clang::CodeGen::CGOpenMPRuntimeNVPTX::createNVPTXRuntimeFunction(), clang::CodeGen::createRuntimeFunction(), clang::CodeGen::emitDeclareTargetVarDefinition(), emitOffloadingArraysArgument(), clang::CodeGen::CGOpenMPRuntimeNVPTX::emitOutlinedFunctionCall(), and clang::CodeGen::CGOpenMPRuntimeNVPTX::emitTeamsOutlinedFunction(). Definition at line 53 of file CodeGenTypeCache.h. Referenced by buildBlockDescriptor(), clang::CodeGen::CGOpenMPRuntimeNVPTX::clear(), computeBlockInfo(), clang::CodeGen::CGOpenMPRuntimeNVPTX::createNVPTXRuntimeFunction(), clang::CodeGen::CGOpenMPRuntime::createOffloadEntry(), clang::CodeGen::createRuntimeFunction(), clang::CodeGen::CodeGenFunction::EmitCall(), emitCatchPadBlock(), clang::CodeGen::CodeGenFunction::EmitCfiCheckFail(), emitCopyprivateCopyFunction(), clang::CodeGen::emitDeclareTargetVarDefinition(), clang::CodeGen::CodeGenFunction::EmitExtendGCLifetime(), emitGlobalToListReduceFunction(), clang::CodeGen::CodeGenFunction::emitImplicitAssignmentOperatorBody(), emitListToGlobalReduceFunction(), emitOffloadingArrays(), emitOffloadingArraysArgument(), emitPointerArithmetic(), emitProxyTaskFunction(), emitReduceFiniFunction(), emitReduceInitFunction(), emitReductionListCopy(), emitShuffleAndReduceFunction(), clang::CodeGen::emitTaskInit(), clang::CodeGen::emitThreadPrivateVarInit(), emitWasmCatchPadBlock(), findBlockCapturedManagedEntities(), clang::CodeGen::CodeGenFunction::generateDestroyHelper(), clang::CodeGen::CodeGenFunction::GenerateObjCAtomicGetterCopyHelperFunction(), clang::CodeGen::CodeGenFunction::GenerateObjCAtomicSetterCopyHelperFunction(), clang::CodeGen::CodeGenFunction::generateObjCGetterBody(), clang::CodeGen::CodeGenFunction::generateObjCSetterBody(), clang::CodeGen::CodeGenModule::GetGlobalValue(), initializeForBlockHeader(), shuffleAndStore(), and supportsLightweightRuntime(). Definition at line 34 of file CodeGenTypeCache.h. Referenced by addIfPresent(), buildGlobalBlock(), clang::CodeGen::CodeGenFunction::createAtExitStub(), clang::CodeGen::createDispatchFiniFunction(), clang::CodeGen::createDispatchInitFunction(), clang::CodeGen::createForStaticInitFunction(), clang::CodeGen::CodeGenModule::CreateGlobalInitOrDestructFunction(), clang::CodeGen::CGOpenMPRuntimeNVPTX::createNVPTXRuntimeFunction(), clang::CodeGen::createRuntimeFunction(), emitAutoreleasedReturnValueMarker(), clang::CodeGen::CodeGenFunction::EmitCfiCheckFail(), clang::CodeGen::CodeGenFunction::EmitCfiCheckStub(), clang::CodeGen::CodeGenFunction::EmitCfiSlowPathCheck(), clang::CodeGen::CodeGenFunction::EmitCheck(), clang::CodeGen::CodeGenFunction::EmitExtendGCLifetime(), emitGlobalDtorWithCXAAtExit(), emitGlobalDtorWithTLRegDtor(), clang::CodeGen::CodeGenFunction::emitImplicitAssignmentOperatorBody(), clang::CodeGen::CodeGenFunction::EmitObjCMRRAutoreleasePoolPop(), clang::CodeGen::emitThreadPrivateVarInit(), clang::CodeGen::CodeGenVTables::EmitThunks(), clang::CodeGen::CodeGenFunction::GenerateCXXGlobalDtorsFunc(), clang::CodeGen::CodeGenFunction::GenerateCXXGlobalInitFunc(), clang::CodeGen::CodeGenFunction::GenerateCXXGlobalVarDeclInitFunc(), clang::CodeGen::CodeGenFunction::generateDestroyHelper(), clang::CodeGen::CodeGenFunction::generateObjCSetterBody(), getBadCastFn(), getBadTypeidFn(), getCatchallRethrowFn(), getClangCallTerminateFn(), getEndCatchFn(), getFreeExceptionFn(), clang::CodeGen::CodeGenModule::GetGlobalValue(), getGuardAbortFn(), getGuardReleaseFn(), clang::CodeGen::getKmpc_MicroPointerTy(), clang::CodeGen::CodeGenModule::getTerminateFn(), getThreadLocalWrapperLinkage(), getThrowFn(), getUnexpectedFn(), and setPropertyExecutionMode().